Home » Store Front » Engineering, drafting and design supplies SALE! 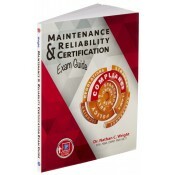 » Maintenance and Reliability Certification Exam Guide SALE! In the fields of maintenance & reliability, there are a number of certifications that “M&R” professionals may take to help further their careers, whether it be in the form of a promotion, a change of job, more money, or simply a title to add to their credentials. The exams for these tests assess the candidates' skills and knowledge in areas such as work management, equipment reliability, leadership and organization, knowledge of the different certifications' bodies of knowledge, manufacturing process reliability, and business management, as well as their ability to adhere to industry standards (both ANSI and ISO). specifics about the different tests. how to study for each. information on where to focus review efforts. hundreds of sample exam questions. practical tips for maintenance and reliability professionals to take back with them to use on the job. Chapters include a list of performance objectives, review questions, as well as lists of supportive reading. Related graphs, tables, charts, and illustrations round out this indispensable work for all maintenance and reliability professionals seeking certification. Dr. Nathan C. Wright, D.M., MBA, CMRP, PMP, MLT1, is a no-nonsense Senior Manager with more than 35 years of successfully transforming troubled companies or divisions in the heavy equipment, manufacturing, mining, food and beverage, and defense industries. Wright offers a history of outstanding success in quickly bringing organizations to greater productivity, revenues, and win-win customer relations. He holds a Doctorate of Management, MBA, Licensed PMP, CMRP, & MTLI, and is known and respected for leadership in three primary areas: General Management, Operations Management, and Maintenance/Reliability Engineering Management. Notify me of updates to Maintenance and Reliability Certification Exam Guide SALE!